So you're planning an event... a wedding, a shower, a birthday party, a dinner party - whatever the occasion, a theme makes it feel cohesive and special. The theme will give you a jumping off point to look for inspiring ideas and will make the decision-making easier when designing all those glorious details. Keeping the theme in mind along the way will help you guarantee that all the little elements create one big picture that is your event. So needless to say, the first thing I did when planning our wedding was choose a theme. One of the easiest ways to start is with a color scheme. When deciding on the colors for our wedding, I went through many iterations before finally coming to a decision. I think choosing the overall theme for our wedding was one of the things I spent the most time on because all of the design details followed that one concept. Ultimately, I (or should I say "we") chose shades of aqua, moss and chartreuse green for our colors along with cream and light grey. I think it's important to decide what neutral colors you're going to use as a base for your more lively shades. I chose these colors because my favorite color is green, I wanted something bright and fun, and it was a combination that just made me smile. The rest of our theme came from inspiration I discovered through Weddingbee. I found so many ideas on this site and the blogs of other crafty, "DIY" women, but what really started it all was the talented Megan Hunt @ Princess Lasertron. (Check her out!) 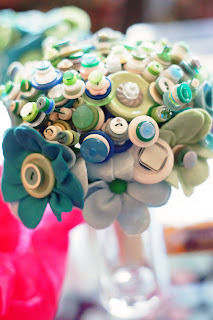 Meg makes gorgeous bridal bouquets out of vintage felt and buttons and I found true inspiration through her work. 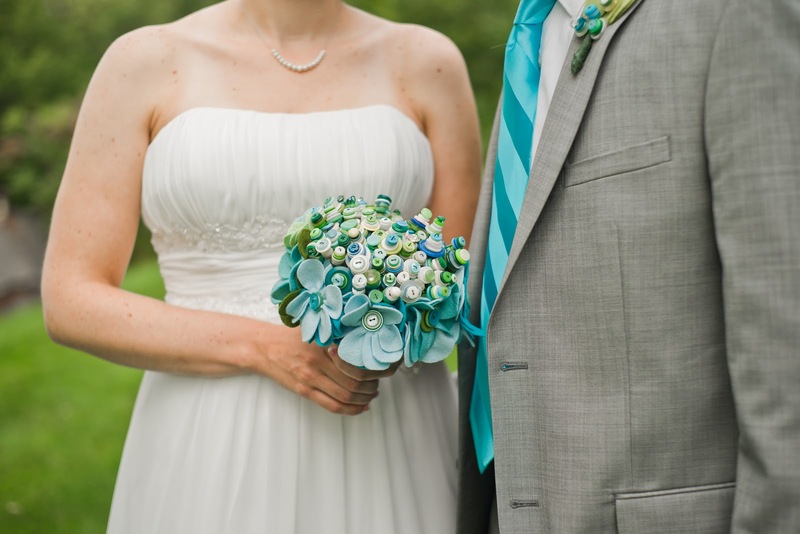 I commissioned her to make my bouquet, the bridesmaids bouquets, boutonnieres and corsage pins. Through her work and my love of crafting our theme evolved into buttons and handmade details. There is so much inspiration out there to help you choose a theme. My major wedding inspiration sources were Weddingbee, Martha Stewart, Style Me Pretty and Princess Lasertron. There are so many resources out there for all types of weddings and these just happen to be the ones that resonated with me the most. Do your research and you will find something to inspire you in no time. Photos by Vic Pellicier @ Pellicier a.p.d.